NEW YORK: Today, the New York Sanitation Department opened bids for the North Shore Marine Transfer Station, part of Mayor Bloomberg’s Solid Waste Management Plan. But environmental activists blasted the department for using two species of old-growth tropical hardwoods for the project. Outside 51 Chambers Street, Tim Keating, executive director of Rainforest Relief, held a four-inch document, part of the “Construction Contract” for the proposed waste transfer marine transfer station on the Queens waterfront; the tropical woods would be used for pilings, fendering and the flooring of flat-bed trailers. At 11 a.m., the time when Sanitation opened the bids, Keating and Joel Kupferman, a lawyer with the Environmental Law & Justice Project, delivered a letter alerting the department to the fact that one of their specified woods, apitong, has been banned from use by New York state law. In 1991, the State Legislature passed the Tropical Hardwoods Purchasing Law; Section 165 of this law provides a list of banned tropical woods and mandates that “the state and any governmental agency or political subdivision or public benefit corporation of the state shall not purchase” these “tropical hardwoods or tropical hardwood products, wholesale or retail, in any form.” This list includes apitong, logged from old growth rainforests in Malaysia. Sanitation Department’s bid order specifies apitong for “hardwood flooring” in Addendum Three, p. 33, Paragraph 2. Click on the image to see the full text from the Sanitation Department's illegal bid. Sanitation plans to construct the pilings and fendering of the North Shore MTS, as well as those of at least three other stations, with tens of thousands of board feet of greenheart, a tropical hardwood from Guyana. Guyana contains some of the largest intact rainforests in the Western hemisphere, many of which are just being opened to industrial logging. In part because of weak regulatory agencies in Guyana, illegal logging is now rampant there. 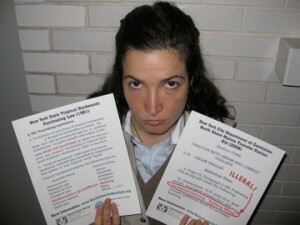 If Sanitation does not have a declaration of proof that documents the legal origin of their greenheart, they could well be in violation of another law: the 2008 amendment to the U.S. Lacey Act states that it is a federal crime to buy, sell, own, import or transport wood that has been illegally logged. City and state agencies, including Dept. of Transportation, Dept. 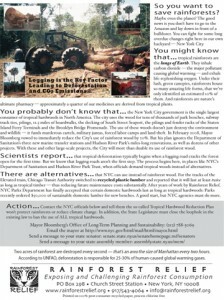 of Parks and Recreation, and Metropolitan Transit Authority, along with public benefit corporations like Hudson River Park Trust, use rainforest wood for benches, boardwalks, subway ties, pilings and decking. 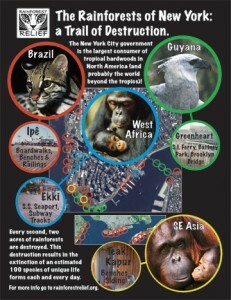 Two acres of rainforest are destroyed every two seconds—an area the size of Manhattan every two hours. UNFAO states that deforestation causes 20-30% of human-caused global warming gases.